The product we’re reviewing today is called Hairprin. The makers of Hairprin claim that their product can regrow hair using only natural ingredients and select amino acids. They also claim that Hairprin will stop hair loss by blocking DHT as well as provide rejuvenation and overall health of the scalp and hair follicles. Find out more about this natural hair regrowth supplement by continuing to read the review below. Take one capsule in the morning and take another capsule in the evening, a maximum of two per day. It is recommended to take them with water and at the same times each day. Hairprin is recommended for adult use only. 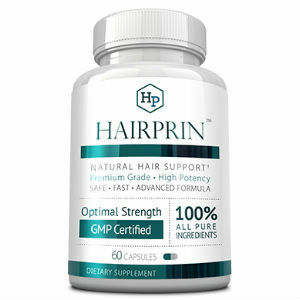 Hairprin does not have any specific side effects associated with it at this time. However, there are some people that should not take Hairprin until a consultation with a doctor can take place. Persons under 18 years of age, persons with a known medical condition, persons taking medication for medical conditions, pregnant women, and nursing mothers should not take Hairprin unless it is approved by a doctor after a consultation. The prices for Hairprin mentioned here are based on the prices shown on the Hairprin website. These prices are for the product only and do not include any shipping charges. One bottle of Hairprin will cost $49.95. If you buy multiple bottles, the price per bottle decreases. Two bottles will cost $69.90. Three bottles will cost $95.85. Four bottles will cost you $111.80. Five bottles will cost you $124.75. Six bottles is the best value, costing a total of $139.80, making the price per bottle a mere $23.30. The makers of Hairprin are quite confident in their product, which is why they back it up with a 60 day money back guarantee. If you are not satisfied fully with the results you get from Hairprin, simply return any empty bottles, full bottles, and partially used bottles within 60 days of receiving the product. You will receive a full refund of your purchase price, no questions asked. You will not be refunded the shipping and handling costs you have paid. It would seem that quite a few consumers are confident in the effectiveness of Hairprin as well, based on the number of positive reviews that have been posted. Hairprin is a good product, and its superiority is multiplied when compared to several similar products. Unlike the products it was compared to, it has a full month’s supply in each bottle. It also contains only natural ingredients with no preservatives, additives, or other unnecessary ingredients. It also has a wide variety of trace mineral blends. John Brownstone	reviewed Hairprin	on October 7th	 and gave it a rating of 5.